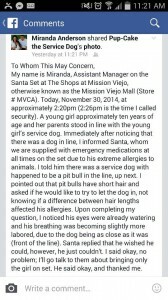 If anyone sees a story posted anywhere on the web regarding an autistic child by the name of Abcde Santos (Pronounced Ab-Suh-Dee) getting denied seeing Santa due to her Service Dog a pit bull at Mission Viejo mall it is a pure smear campaign and the real story is not getting out which is very sad. 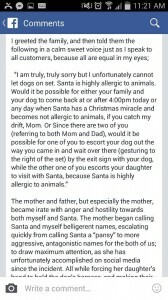 If you hear all sides of the story, the family was TOLD KINDLY several times to come back for a Santa that was NOT ALLERGIC to dogs – I have no respect for the PR firm and people behind spreading such press releases which don’t mention the Santa was allergic to dogs. I also don’t have respect for the journalist and the publications that decided to take the press release and run with it. Stay At Home Mothers and How They Compare. for one – that it NOT the assistant manager.. it is some ignorant b!$ch pretending to work for the mall so she can say what SHE wants to say.. the mall where this happened has already announced that person does not work for them. The mall makes NO claim that Santa was allergic – get your facts straight. The story, plain and simple, is Santa denied an autistic girl of seeing him and asking HIM what he wanted for Christmas . If Santa was terribly allergic to dogs, he would most likely be on medication because if his allergies were TRULY that severe, people passing by him with hair and dander on their clothes would cause an allergic reaction. Other women who were there have corroborated this story. 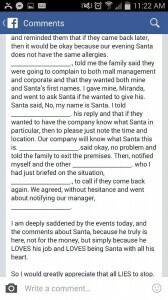 Also her not working for the mall doesn’t mean anything, the mall already said that they were using an outside Santa organization, the Santa himself didn’t work for the mall either. It’s tragic that a man was fired because these people wanted attention on social media. No, other people on the internet claimed that. Just like this Miranda person, whose post was REMOVED. Santa and his elf were fired. Other witnesses in real life backed up this families story and Miranda’s post was REMOVED. Keep grasping at straws for anything you can find to vilify this family, who are the victims. How many children with fur and dander from dogs at home sat on Santa’s lap? That did not trigger his allergies? Service dog my a$$. These frauds are taking advantage of the way too lenient laws within the ADA. Time to possibly revisit them and possibly allow for the request of service certification. Always gotta be a few that spoil it for the rest. You weren’t there. You know only what you’ve read. You’re talking completely out of your a$$. The fact this so-called service dog has his own PR firm and the family already pulled a stunt once before tells me all I need to know. yep! This isn’t the first time they have pulled a stunt like this!! 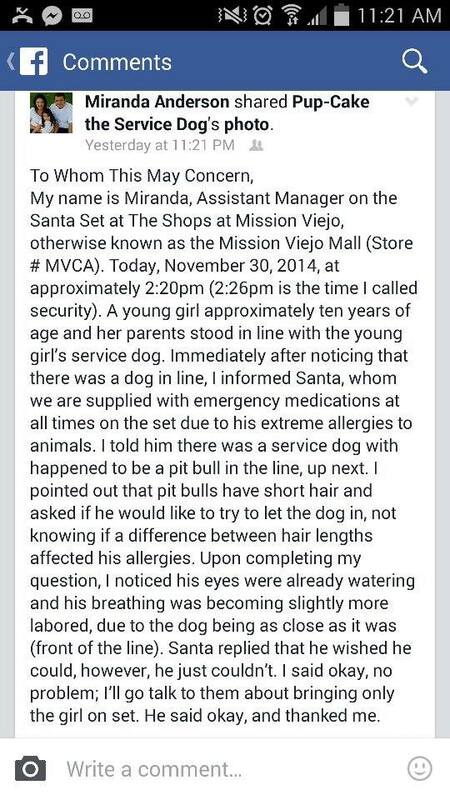 The mom is nuts and ALWAYS complains about the dog! She is only hurting her kid putting her in a media circus bc she wants her 15 minutes of fame again! Shorty’s Charities is on record for issuing the press release for Pup-Cake the Service dog and the Santos family in the Tom’s Farm case. Abcde’s parents love the attention. It’s truly sad what they have made of their daughter’s disability. Ugh, that name. Makes it very clear how uneducated they are. I am truly distressed. When I see all the time and emotion people have put into this one kid not getting to speak to a fictional character this one year because of a damn dog, I’m scared about where we are headed as a species. You know what is really interesting, I have spoken (yes I have been on the phone with them) to multiple people that were present at the event. And guess what, this family is FULL OF CRAP!! The parents are the ones that got argumentative, not Santa or his Elf. Santa did say that he had an allergy and was beginning to wheeze. The Miranda story is more fitting of what really happened, according to 3rd party witnesses (Didn’t fit entirely, but the whole line of “those dogs eat people” and “those people support those animals” is completely FALSE!! . The only reason they were fired was to protect the company as a whole. And coming from someone who has a cat allergy, I can be around people who have cats all day long, but those lovable animals bring my eyes to tears, nose running, and problems breathing. 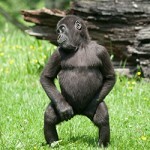 It is not a matter of dander so much as it is a matter of quantity of dander. 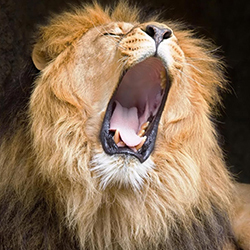 By the time that cat person comes up to me, there has been at least 30 minutes of time (give or take) since they were with their animal (factor in the fact that the air is probably on in their vehicle, so that means that there is less dander really on the person.) This entire smear campaign is crap against a loveable man with a heart of gold. The fact that this family has PR releases makes me a little skeptical of their motives. If they truly wanted to “educate” they would not take joy in people being fired during the holiday season. 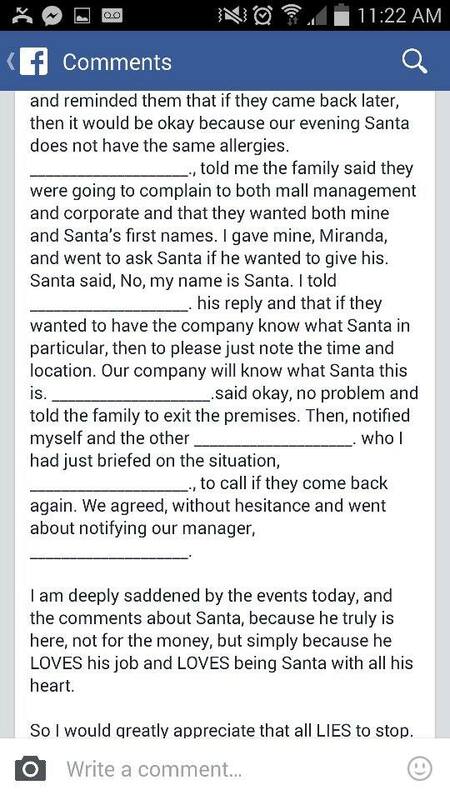 The Santa was hired by an outside company that is independent of the mall. All of the companies want to avoid lawsuits. I am sorry to say after that balloon boy hoax I am suspicious when there are PR firms and such, is it parents trying for reality tv or other financial gain? And people with severe allergies themselves are protected under the ADA, the key being reasonable accommodations. If one has severe cat or dog allergies and they work at an animal shelter well, there may be no way to reasonable accommodate them, but if they work in a mall there are reasonable ways to accommodate. (like keeping cats and dogs away from the worker). Wow. Funny how when people actually stand up for the rights of children with special needs. Everyone wants to jump on them saying the parent want attention. 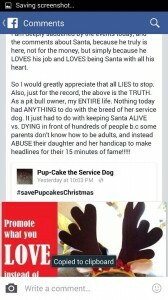 The person that posted all that nonsense, posted falsely speaking on behalf of the mall and the company she worked for. Switching stories out only AFTER THE FACT that she was called out publicly only adds to the drama already created. 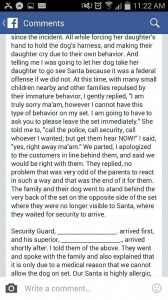 It is fact that she did not offer any solutions for the family, only AFTER security had kindly asked her to allow the girl to see Santa with NO DOG, only to be refused for the second time. When asked for the companies contact information, the family was refused again. IF her statements are valid, why is giving the company contact information a problem? The biggest problem is that so many people are mislead due to false information from those that did wrong, that when a family of special needs speaks up, the family is pointed fingers at. The person writing this blog is out for one thing, to get hits and attention and they got it, even at the expense of a 7 year old autistic child. PS the story on the family posting a claim is due to the fact that once before they were wrongly discriminated against. If you are going to bash a story, at least get the fact first.